Raumfahrt+Astronomie-Blog von CENAP - Blog: Raumfahrt - Keime im Raum! NASA brachte WHYY Mikroben zur ISS um sie bei Schwerelosigkeit zu beobachten . A microbe collected at WHYY was one of 48 samples recently sent to the International Space Station to test how microbes grow in microgravity. Recently, we reported on the Earth Microbe Biome Map. It's a huge project, where microbiologists are logging samples of microbes — like bacteria, amoebas and fungi — into a database that will create a map of the entire world, at a microscopic level. There's a second part to the project, involving the International Space Station (ISS), and a bacterium collected right here at WHYY. On April 18, NASA launched a cargo spaceship to bring supplies and scientific experiments to the International Space Station. Along for the voyage were 48 samples of specially selected microbes. Scientists know that we each carry a massive number of microscopic lifeforms on and in our bodies. So as humans gear up for commercial space travel and spending extended periods of time in space, microbiologists are wondering, how the microbes that are coming along with us will behave in that environment. "The scientific reason is to see how well various microbes grow in microgravity compared to on Earth," explains microbiologist David Coil, one of the project's researchers. The official name is Project MERCCURI, for Microbial Ecology Researchers Combining Citizen Science and University Researchers on the ISS. "It's sort of a tortured acronym," Coil admits. An identical set of the 48 samples was kept at the University of California at Davis, to serve as a baseline for comparison. "The astronauts will take out a sample, thaw it out, and grow it up for 96 hours. And we'll be doing the same thing here on earth at the same time, and that's what we'll use to compare the results," explains Coil. The samples came from many sources, like sporting events, and famous icons such as the Liberty Bell. 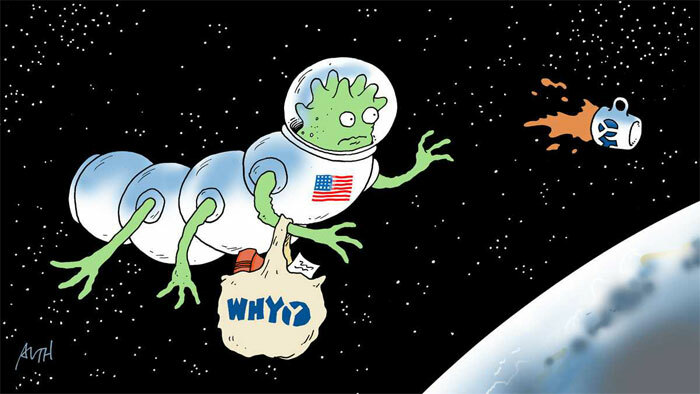 So it got us wondering, what sort of microscopic life might be lurking around WHYY? We took some samples, and a microbe found in one of them was chosen for the space flight. It's a bacterium called Macrococcus brunensis. Microbiologist David Coil thinks it's a good pick because of its anonymity. "Almost nothing is known about it," he says. "The best I could say about it was that it's awesome because it was isolated from llamas in the Czech Republic." That doesn't necessarily mean a WHYY reporter has been petting Czech llamas. Coil says it shows how widely traveled microscopic species can be. "It turns out that a lot of microbes are found everywhere. I'm sure if you looked at your computer, you could find a hundred species of microbes, some of which were originally isolated from all sorts of strange places, and if you looked hard enough you'd probably find species that weren't even known to science," Coil says. Aside from investigating the microbes' behavior in space, the researchers have set up a competition among the chosen samples. "Which microbe is the fastest sprinter, which grows the fastest?" says Darlene Cavalier, founder of the citizen science website SciStarter and Project Director for Project MERCCURI. "We're doing that to play off of the fact that many of the samples came from NFL and NBA stadiums," she says.